Multiple Stakes winner Miss Rose de Lago indicated she could be in for a good preparation after impressing in a 1000m jumpout on the polytrack at Racing.com Park Pakenham on Monday. The Danny O’Brien-trained mare settled just behind the leader before cruising to the front under jockey Damien Oliver and winning by more than three lengths over her stablemate Paco Express without being extended. After securing a career-highlight with a dominant victory in the Group 2 Sunline Stakes (1600m) at Moonee Valley in March, the daughter of Encosta de Lago was last seen finishing unplaced in the Group 1 Queen Of The Turf Stakes (1500m) at Randwick in April. 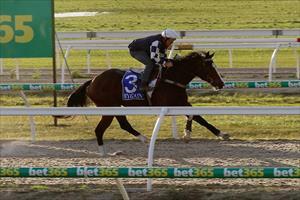 O’Brien said the rising six-year-old would more than likely resume in the Group 2 P.B. Lawrence Stakes (1400m) at Caulfield next month, before running second up in the Group 2 Dato’ Tan Chin Nam Stakes (1600m) at Moonee Valley. “We’re probably going to run her against the boys earlier in the spring, she’s not a mare that’s going to perform below a mile (1600m) or 1400m first up,” O’Brien said. “We’ll get a fair indication of where we’re headed with her after the first couple of runs but there’s obviously plenty of mares targets for her later in the spring like the Myer Classic. “She went really well this morning and she’s been going really well in her work at home. “She just came here for a day out today but she’s a super-competitive mare and she’s always going to show you something when you get her out of the gates and she showed her class this morning.